Looking to hang a heavy mirror? Or possibly a collage of pictures on a wall? Do you often wonder what is the best anchor for you needs, and do you even need an anchor for your application? Here are some tips that we have accumulated for the different types of fasteners and anchors that are on the market. We hope that you enjoy the information! Plastic Anchor - Suitable for many lightweight applications and versatile enough to use in almost any material. Great option to stock at the house when you need something in an pinch. Rated for about 10 lbs when used in drywall or plaster. Ribbed Plastic Anchor - Very versatile, just like its cousin the plastic anchor, but with a little added strength. Can be used in a variety of materials, but offers a little bit more strength since the anchor spreads inside hollow walls to provide more grip. Rate for about 15 lbs when used in drywall or plaster. Wallboard Anchor - These are one of my new favorites since they do not require you to pre-drill a hole in the wall. Available in nylon or the more durable zinc. They are ONLY intended for use in drywall and are rated for 50 lbs. Pop Toggle - The pop toggles is often recommended for bathroom fixtures and hardware being mounted to a hollow door. You pre-drill, tap the pop toggle into the wall, and then "pop" the fins out to grab behind the wall (or cabinet). Like its counterparts, the pop toggle is recommended for hollow wall or thin wood applications, but if you do happen to hit a wooden stud when drilling, you may still proceed with using the pop toggle. Allows you to install and remove the screw at your convenience. Rated for about 80 lbs of weight. Strap Toggle - This is a new take on the toggle bolt. The Strap toggle is a pre-assembled, heavy duty hollow wall anchor that allows you to install and remove the screw and fixture as often as you would like! It is also self-drilling when going through drywall and does not require such a large hole to be drilled through other materials (not drywall). Rated for about 80 lbs of weight. Toggle Bolt - The classic toggle bolt is the preferred option for most any vertical (or ceiling) installations and it intended for hollow wall applications. This option does require you to pre-drill a pilot hole for the winged piece to fit inside the wall, but it does offer you unparalleled strength (over 120 lbs of strength with each bolt). Rated for 120 lbs in drywall, block, plaster, and tile, but up to 330 lbs through block wall. Lag Shield (Concrete Anchor) - Short sizes work great in block wall and longer sizes work great in concrete. These lag shields require you to predrill, but they offer secure anchoring in concrete, block, and mortar joints. Great for outdoor situations such as mounted of a flag pole mount. As the name suggestions, you must use lag screws inside of lag shields. Rated for at least 200 lbs. We hope that this review of the most popular types of anchors was helpful. 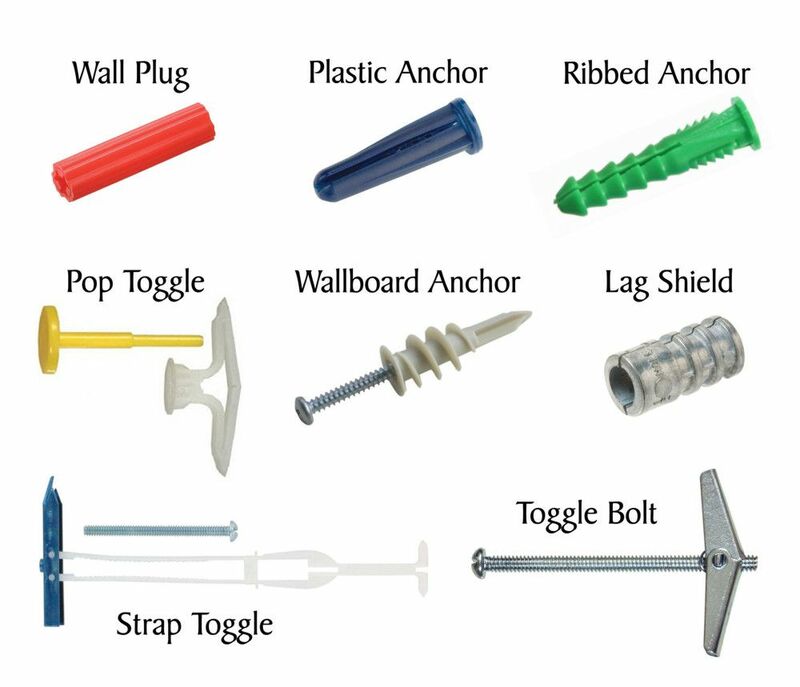 There are quite a few other options that we offer on a daily basis in our hardware department including Strike Anchors, Sleeve Anchors, Drive Wall Anchors, Hollow Wall Anchors, Lead Anchors, Tapper+ Concrete Screws, and Walldog Screw/Anchors. Of course, if you need a recommendation for a specific project you are working on, we are always happy to help... just stop on by our store!